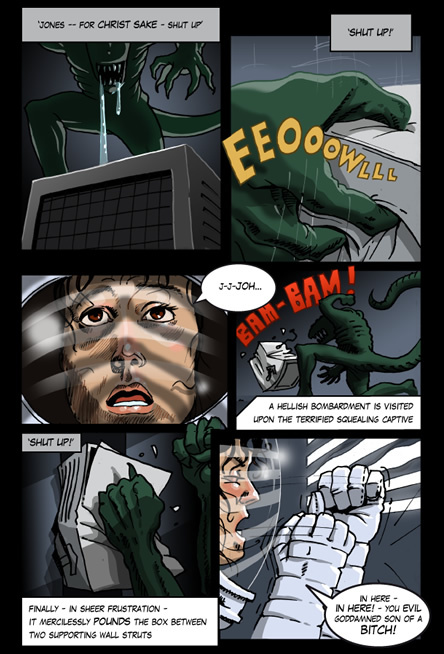 ALIEN age 11 - Comic/Graphic Novel and Blog: "Jones!" 1982? Here it is: the 2nd brand new page of my old 1979-82 adaptation. I won't pretend that I think it's brilliant - but it has its moments. The alien in panel 1 just looked a bit silly until Gabby recommended covering some of his upper half - focussing on the teeth. She was right. Anyway - it's all part of the learning experience. I reckon the next one will be fairly awesome. I pencilled it yesterday and hope to ink it tonight and colour and letter it tomorrow night. With a bit of luck it'll go live on Thursday! As you can see I'm not only sticking to my old ill-informed creature design but following the novelisation pretty closely too. I'm going to try and blend the two of those with the actual film version. Gabby and I went to see it again last Sunday. I swear it gets better every time. There's always something more to see. We were searching the screen around the characters for more details that we'd missed! The script has been slammed by countless viewers as weak but it's amazing what insights you fleetingly catch via what's not said - in the small changes of facial expression: Fassbender's a master at this. I posted about this on Reddit and there has been a massive response. I was even called a viral-marketing studio exec! Yeah right, me: a marketing expert. It's interesting how the sci-fi-monster-movie feel gradually gives way over more viewings to that of a sci-fi-big-concept movie. Gabby and I were lucky in that we weren't expecting to have the mysteries of creation unlocked (it's a fictional film!) and so we enjoyed it as somewhat thought-provoking entertainment. Many people however were expecting either an ALIEN prequel or Ridley's 2001. I don't think it just falls inbetween but I rather suspects that's it's both, and morphs over time from just being the former. It's a tricky juggling act and I think Scott and the writers deserve credit for pulling it off. More, in a few days!